Ususally, the first step to start using Reveal Chromatography is to load experimental chromatography data. Much more information on how to prepare experimental input files can be found in the Preparing experiment input files section of this manual and users are strongly encouraged to read that before attempting to use Reveal Chromatography. Once the input file is ready, to load it in, begin by navigating to File > New Project from Experiment File... (or ctrl-L). Select the input file, and click Open. 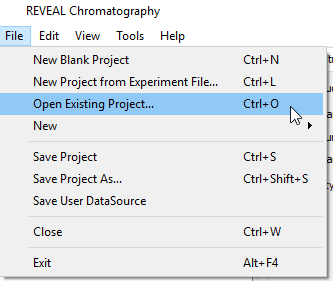 Reveal Chromatography will then analyze this input file and, if some experiments point to AKTA files for their continuous data, will parse these AKTA file one experiment at a time. The purpose of the Experiment Importer is to make sure that the AKTA file is loaded correctly, and that it its information is consistent with the experiment information found in the Excel input file. an interactive preview of the UV curve in the third tab. If the loaded experiment is about a single-component protein (for example pulse injection experiment), below the UV curve with be an analysis of the mass balance. Another customization that can be applied when loading the AKTA file is to shift the time of origin, to ignore some portion of the data present in the AKTA file. The selected time will become the time of origin in the Chromatogram plots. For example, continuous data may have been collected for an equilibration step before the load, but simulations in Reveal may only start at the load step. Typically, users will want to set the Time of origin field to reflect the time that the Load step begins in the AKTA file. To determine the appropriate value for this field, users may want to use the AKTA file view in the Preview tab. Note the search functionality, accessed by pressing ctrl-F, which may be useful to search through the AKTA log and to find the Load start time. In this example, the start of the Load step is found in the time stamp immediately to the left of the log column, and for the tutorial file, that’s 0.0 because the AKTA file’s origin was reset to t=0 at the beginning of Load. Typical files will have a time origin at the pre-equilibration or equilibration steps. If that’s the case, users will need to enter the time value into the Time of origin text box of the Settings tab of the AKTA loading assistant. Next to the time of origin field users should specify the name of the step which starts at the time of origin. That will allow Reveal to know how to align the method information and the AKTA timeline, something that is useful to analyze mass balances in experiment and making sure the experiment is correctly specified and ready to be used to calibrate a model. In the third tab, users will find an interactive preview of the UV chromatogram curve in the third tab. It will update based on the selected time of origin, applying the shift of AKTA timeline as selected in the settings tab. If the loaded experiment is about a single-component protein (for example pulse injection experiment), below the UV curve with be an analysis of the mass balance to make sure the AKTA information and the load and method information in the Excel input file are consistent. Discrepancies between the 2 will affect the ability to calibrate and model and/or lead to a non-predictive transport model, if for example, the loaded volume or the load solution concentration isn’t accurate, as can often be the case with small volume Pulse Injection experiments. 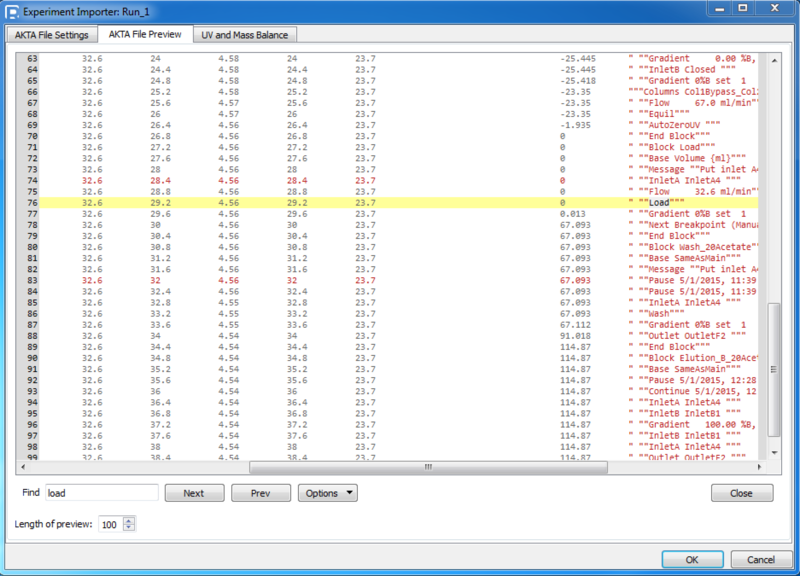 If a discrepancy is found, both the loaded product mass as inferred from the method and solution information and from the UV data are displayed. User can then select to “Do nothing” (default, not recommended), modify the step’s volume (can be done by Reveal automatically) or modify the load solution’s concentration (must be done manually since it will affect all experiment that use that solution). The tool in this case will just display the concentration that would match the UV data and users should write it down, abort the load and review their Excel input file. Note that there are other parameters that could be inaccurate beyond the load step volume and the load solution concentration. For example, the UV data uses multiple parameters to concert the curve into a mass, in particular the product component’s extinction coefficient. Once all import settings are accurate, click OK to finish loading that experiment. If there are more AKTA files to be loaded, a new assistant will appear and parameters will need to be set for that new file. Once the experimental data has been loaded, some of the folders in the study data browser will be populated with the details of the experiment(s) that have been specified in the input file. These elements may now be used to build new simulations. See the Simulating experimental data document for more details on how to do this. Most products should include in their definition a component named Strip to model the material that binds to the column like other components, but elutes after the pooling step, typically during a Strip step. For details on how Reveal simplifies creating products with such a component, see Strip component handling. One way to model these products well, and make sure to avoid mass balance inconsistencies is to evaluate the amount of product eluting during the strip step, and to adjust the load composition accordingly. Otherwise, the model will over-estimate the amount of the regular components, and will be unable to predict the correct chromatogram amplitude. At the very bottom of the tool, is provided both the Strip fraction currently in use (initially 0%) and a text box where users can type in a different fraction. Since the fraction of product eluting in the strip may depend on the experiment-specific setups (such as the column or method used), that fraction is allowed to be different for each experiment. Consequently, each experiment is displayed as a separate tab in the tool. To guide the user to choose the right fraction of total product to assign to the Strip, users may first refer to the experimental chromatogram, the main window and its plotting tools still being accessible. Additionally, a value is computed based on the provided inputs, and available data. That value is computed from the product mass integrated between the start of the load step and the start of the strip step and the product mass loaded into the column. Note that the tool can’t compute the step start times correctly if the method described in the Excel file and the AKTA file don’t have the same time origin. Consequently, these times can be edited, which triggers a recomputation of the proposed strip fraction. In fact, the tool exposes all the inputs that impact the strip fraction, that is the average product extinction coefficient and the loaded amount (volume and concentration). Changing any of these parameters will trigger a recomputation of the proposed fraction. That is useful to explore what impact these parameters have on the strip fraction, when the computed value is in disagreement with the what seems to elute during the Strip step according to the chromatogram. 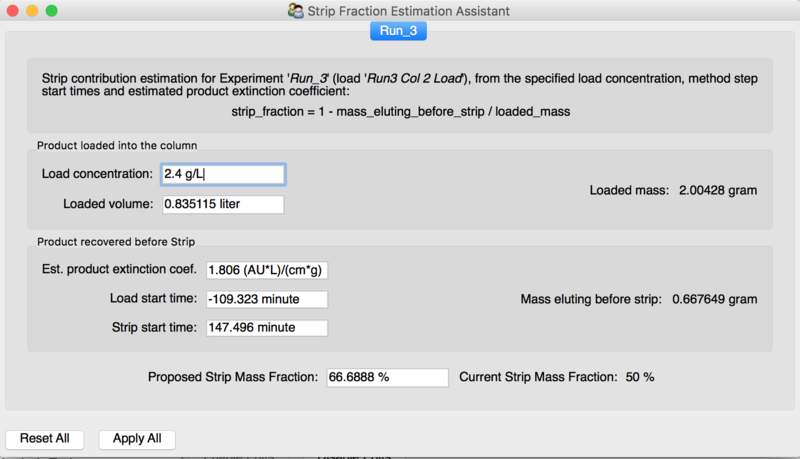 Once the desired fractions are typed as Proposed Strip Mass Fraction for all experiments, users should click the Apply All button. It is important to note that Study and User Data do not get saved to the same locations. User Data is saved automatically in the internal Reveal files, and is saved separately from any study. On the other hand, a .chrom project file only contains Study Data, not User Data. If changes are made to the User Data, simply save the User Data as the new default data using File > Save User Data or click the hard disk icon located in the toolbar. Note that the location of the .chromds file created can be controlled using the application’s preferences (see Customizing the application: the preference panel). Additionally, to simplify sharing User Data with other Reveal users, it is also possible to manually export User Data to a file for sharing, using the File > Export User Data As... (PRO ONLY). Study data gets saved into a project file that the user specifies and names. This file includes everything in the study: experiments, simulations, the elements they are built from including transport and binding models. To save the current state of a study, select File > Save Project if it has been saved already once, or File > Save Project As... otherwise. The user will then be prompted to choose the name and location of the project file. However, not all data generated by Analysis Tools will be saved into project files. This is because analysis tools, such as parameter explorers and parameter optimizers, may generate thousands of simulations, each containing very little value. Saving them all would lead to over-sized and unpractical project files. For parameter optimizers, the optimizer’s type, name, target experiments, cost information for each simulation and optimal simulations are saved. Information about each optimization step is also retained, including its parameter list and values, and cost data. But, other than optimal simulations requested, all other simulations in each optimization step are not saved. Consequently, once an optimization has been saved, its cost function can no longer be edited (see Editing the cost function (OPTIONAL).) The resulting graphs and heat maps may still be viewed, but its weights can’t be modified nor its cost recomputed. 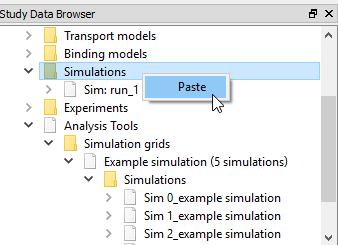 Again, if more needs to be saved, users may consider increasing the number of optimal simulations in the optimizer, and/or copy them into the study’s simulations list. Another potentially useful object to retain in the study is the transport or binding models of a simulation of interest. Make sure to rename these models before copying them, so that no ambiguity is left once they are added in the list of transport or binding models.